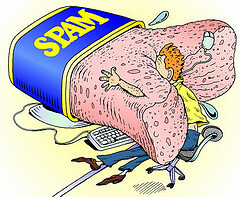 I’m inundated by email as most people are. I’m a newsletter “grazer.” I very rarely spend much time on an individual newlsetter but I enjoy the stream of newsletters that make their way to my mailbox. When the volume of newsletters becomes unmanagable, I go on an “unsubscribe” campaign. Then I let the newsletter volume build up until it’s time to purge again. I am not pleased when I’m asked to confirm a newsletter I already subscribe to. These unsolicited emails impose a requirement to take action in order for me to preserve something I already have. By the way, I never explicitly subscribe to newsletters and I doubt very many other people do. I usually receive newsletters after I sign up for an account on a website. If the website doesn’t require that I sign up for an account in order to access information, chances are that I will not sign up for a newsletter and will end up forgetting the site altogether. Thank you for this great post, Peter. “Bigger is better” and “the more the merrier” is only sometimes true. A bigger email list is a prime (make that prime +) example: like debt in the junk bond era, bigger is only better when used judiciously. When used improperly, it can readily lead to failure. To be successful, consideration of the what (message)- when (to send it)- where (if an email goes to spam, or where to post it) – and why (your intended audience would care) are important as is the who (is on your mail list). Organizations naturally want to grow their reach and be inclusive- your post provides insights on how that can be best accomplished. I also agree with @susan above that one of my reasons to stay signed up is remember an organization who’s work I found interesting. So those emails may be rarely opened, even though I want to continue receiving. They’d lose me if they followed the automated opt-out suggestion above. If I had my choice, I’d be able to opt to hear from these organizations quarterly or even annually – as you used to in the old days of paper. I even find it rather presumptious that so many organizations think that just because I showed an interest in their work, I must hear from them on a weekly basis. I have tried in vain with organizations I really want to stay connected with (just not every day) to opt for quarterly (or even just monthly) updates, and where that’s not available I’ve unsubscribed instead. So another way to think of open rate is not just % of recipients who open the weekly e-update, but % of opens per constituent, which in my case is strongly correlated to list volume; I am far more likely to open from a sender that is ‘rare’ in my inbox. It is easy not to open today’s move-on email because I know there will be another one tomorrow – so my % of opens is higher for infrequent messages than for frequent ones. From my POV as a high volume list recipient, it’s not just the quality of your list, but the quantity of your emails. I completely agree with @jenny & @susan. I would extend jenny’s commentary to snail mail also. Just because I sent a donation does not mean I want to be inundated with mail from your organization every week/month, etc. An annual donation request would suffice for me.